Once upon a time, you could drive from Pensacola to Panama City with veritably little traffic and a view of the water out your window. Soon, however, the hotels and restaurants began to pop up – and, with them, a bevy of shops to fill your beach bag. 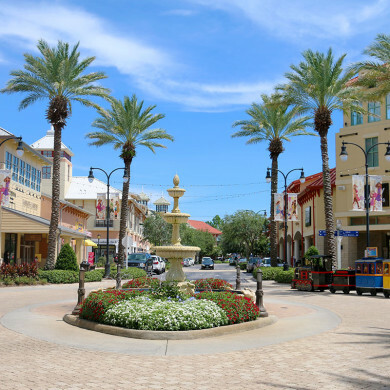 But no place does shopping quite like Destin Commons, an uncommonly good destination for families and singletons both young and young-at-heart. If you’re in the mood to shop until you drop (into a chaise lounge), head down Highway 98 to the open-air lifestyle center that offers everything from the top stores to the best in dining and entertainment. In the late 90’s, the Destin area welcomed a significant influx of tourists – so many, in fact, that a study conducted by D.K. Shifflet & Associates for Visit Florida revealed it to be the state’s No. 2 drive-to destination, surpassed only by Orlando. So Miami-based real estate development and property management company Turnberry Associates seized the opportunity to create Destin Commons, the first outdoor lifestyle center with more than 80 percent of retailers representing the only store of its kind in the region, according to Director of Marketing Annette Alvarez. Opening in November 2003, the 56-acre center housing more than 75 shops and restaurants was immediately embraced by locals and tourists alike. 2013 marked Destin Commons’ 10th anniversary, kicking off with a 100,000 sq. ft. expansion to make way for new tenants including H&M, Chipotle, Tervis, Everything But Water and Uncle Buck’s Fish Bowl & Grill by Bass Pro Shops – a sunken-ship themed restaurant featuring 16 bowling lanes, billiards and great food. During the summer, that splash pad is a family favorite as children enjoy running through the spraying jets to stay cool. The little ones can also hop aboard the kiddie train that chugs through the center all year long. On top of festive holiday events, many of the center’s stores host regular activities including weekend cooking classes at Williams Sonoma; children’s activities and adult paint parties at Abrakadoodle; and special events and birthday parties at Build-a-Bear Workshop. And don’t miss the chance to make fishy faces at the enormous Bass Fish Tank inside Bass Pro Shops. You can expect to find all your old standards, and maybe some new favorite stores, including Abercrombie & Fitch, Bath & Body Works, Books-A-Million, Express, Francesca’s Collections, Gymboree, LOFT, Pandora Jewelry, Sephora, Victoria’s Secret, Yankee Candle and more. Take it from us, you might need a bigger beach bag. For more information including a full listing of retailers, please visit the Destin Commons website or call (850) 337-8700.